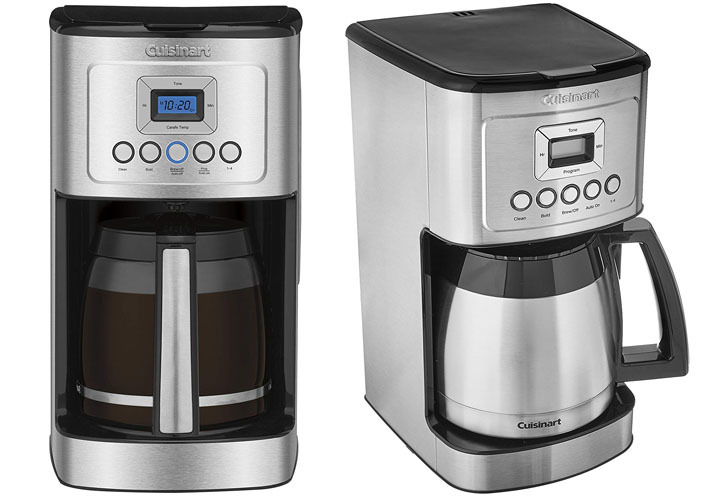 If you are looking for a good coffee machine with a budget of around a hundred bucks, there are two products from Cuisinart that you may want to consider: Cuisinart DCC-3200 vs DCC-3400. These two coffee makers are equipped with decent features, including brew strength control and nice carafes, and they can deliver good coffee. So, which one is better? First of all, there is a minor difference between Cuisinart DCC-3200 and Cuisinart DCC-3400. At first, the difference is not really noticeable. These two coffee makers look very similar to each other. However, if you put them side by side, you will see that Cuisinart DCC-3200 is slightly taller than Cuisinart DCC-3400. See also: Cuisinart DCC-3200 vs DCC-1200. Cuisinart DCC-3200 measures 9 inches wide, 7.75 inches deep, and 14 inches tall. It has a weight of about 9 lbs. This coffee maker is quite compact and space-friendly, and the rectangular profile will allow you to fit it easily into your kitchen or office room. Just make sure that it has some free space on the top because you will need to take off the lid in order to refill water into the unit. Cuisinart DCC-3400 measures 9 inches wide, 7.75 inches deep, and 14.25 inches tall. The weight is just a little over 9 lbs. The increased height is because the unit needs to accommodate a taller carafe. However, this is generally not a problem, as most kitchens are usually more concerned about lateral space than vertical space. The unit still takes the same surface area as its sibling. Both Cuisinart DCC-3200 vs DCC-3400 have very similar designs. Each of them is shaped like a box, with a hollow compartment on the front where you put the carafe. The housing has a nice brushed finish. The top lid is removable to reveal the water reservoir. The control panel is on the front, featuring a blue backlit display that is easy to read in all lighting conditions along with a handful of control buttons. These two coffee makers have unremovable water tanks. This may sound a little bit inconvenient. However, you don’t really need to worry. These coffee makers are still easy to refill, as you only need to lift their top lids to do so. You just need a bottle or measuring cup to carry the water to the unit; make sure that it is large enough so that you can fill the reservoir in one run instead of going back and forth. The primary difference between Cuisinart DCC-3200 vs DCC-3400 is the carafe. Despite having very similar looks and feature sets, these two models actually come with different carafes. In general, the carafe of Cuisinart DCC-3200 is better than that of Cuisinart DCC-3400. Cuisinart DCC-3200 comes with a glass carafe with a stainless steel accent on the handle. It looks very stylish and elegant. It has volume markings on the side, so you can easily tell how many cups of coffee that still remain inside. The maximum capacity is 14 cups, meaning that this carafe is actually larger than Cuisinart DCC-3400’s carafe. You can easily see the coffee inside through the transparent wall. The glass wall is thick and quite durable. Cuisinart DCC-3400, on the other hand, comes with a thermal carafe. It also has a stainless steel accent on the handle. The maximum capacity is about 12 cups. So, although it looks taller, the space inside is actually smaller than Cuisinart DCC-3200’s glass carafe. Nevertheless, this carafe can do a decent job in keeping the coffee warm for some time. It has a transparent window through which you can monitor the remaining amount of coffee inside. The features of Cuisinart DCC-3200 vs DCC-3400 are mostly similar. Both are programmable coffee makers with auto off and self cleaning functions. Both also have adjustable brew settings, so these coffee makers are great if you want to customize and personalize your coffee. The difference is that Cuisinart DCC-3200 has a carafe temperature control, while Cuisinart DCC-3400 doesn’t. Cuisinart DCC-3200 has four buttons around the display: Carafe Temp, Hour, Minute, and Tone. By pressing the Carafe Temp button, you can keep the coffee in the carafe warm at a specified temperature. Meanwhile, to program the coffee maker, you need to press the Prog button (one of the round buttons) and use the Hour and Minute buttons to set the time. Cuisinart DCC-3200 has the Extreme Brew option. When enabled, the unit will brew your coffee at higher intensity, hence resulting in bolder and stronger coffee. This is a very nice feature. You can also adjust the brew size for 1 – 4 cups. The brew pause function will allow you to pause the brewing process temporarily to sneak a cup from the carafe. In addition, Cuisinart DCC-3200 has an auto off (adjustable between 0 – 4 hours) and self-clean functions. The coffee maker comes with a permanent gold tone filter, which is definitely very useful for the long term. You won’t need to replace the filter. Cuisinart DCC-3400 doesn’t have a carafe temperature control. Around the display screen, there are four buttons: Program, Hour, Minute, and Tone. 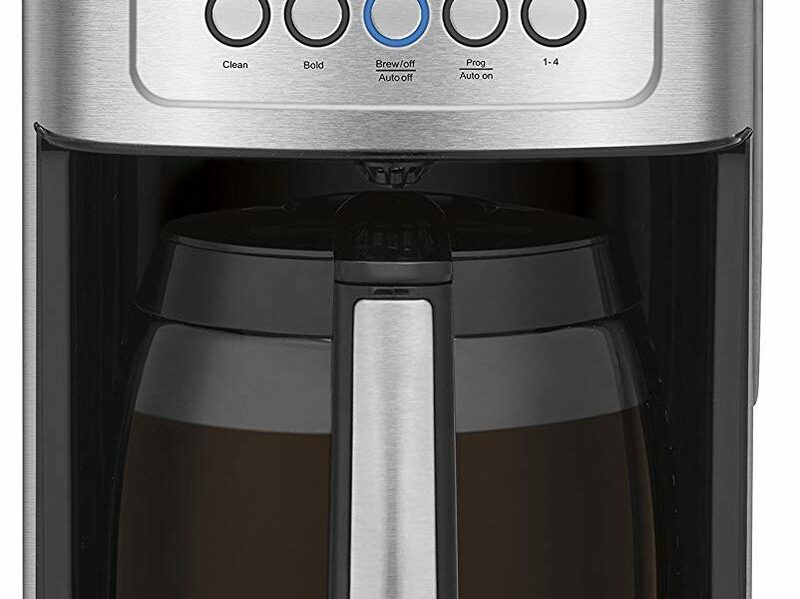 Press the Program button to make the coffee maker brew coffee automatically at a certain time every day, and use the Hour and Minute buttons to set the time. The Tone button is used to enable or disable the ready alert tone; when enabled, your coffee maker will play an alert tone whenever it finishes brewing. 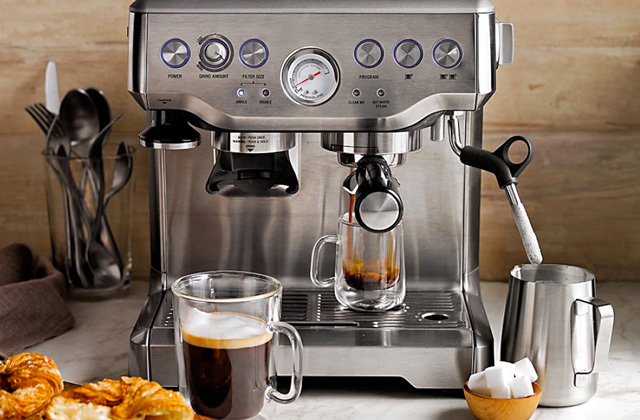 Cuisinart DCC-3400 also has the Extreme Brew option for making stronger coffee. It is also equipped with auto off and self-clean functions, as well as the permanent gold tone filter. Thanks to the reusable filter, you won’t need to spend money for filter replacements in the future. In terms of coffee quality and performance, Cuisinart DCC-3200 and Cuisinart DCC-3400 are similar. They both are decent coffee makers that can deliver good quality coffee. However, they are not really fast; they usually take about 5 – 10 minutes to brew for the full carafe in the bold setting. So, it is a wise idea to program your coffee maker to start brewing automatically at the time that you wake up, so you can have fresh coffee ready for breakfast. In the regular setting, the coffee quality is pretty good. It has a recognizable coffee flavor. It is not too bitter or overburned. People who don’t like strong coffee will prefer to use this setting. Meanwhile, in the bold setting, avid coffee drinkers will find that the coffee quality is even better. It is bold and strong. The flavor is nicely enhanced, without making the coffee taste overburned. However, if you don’t like strong coffee, you should just disable the bold setting. By the way, the bold setting will make the brewing process a little bit longer. However, you should avoid leaving the machine to stay on for several hours; it will lead to increased brewing temperature and the coffee will be overcooked and bitter. This is where the auto off function becomes very handy. By turning off the machine when not in use, you can preserve the quality of the coffee. Both coffee makers here are backed by a 3-year limited warranty by the company. This warranty will cover any defect found in the parts or workmanship. However, it won’t cover any damage that is resulted from improper use, abuse, neglect, or normal wear and tear. It should be noted that the heating plate is prone to peeling and rust. The company considers this as normal wear and tear. You should try to keep the heating plate dry in order to prevent or at least slow down the peeling and rust. Last but not least, let’s see the available color choices on Cuisinart DCC-3200 and Cuisinart DCC-3400. You probably want to get a coffee maker in your favorite color, or a color that matches your kitchen’s decoration. Cuisinart DCC-3200 has more color choices. It has four color options, which are White, Stainless Steel, Black Stainless Steel, and Copper. They all look modern and stylish. They all are equipped with a blue backlit display. Cuisinart DCC-3400, on the other hand, is only available in the Stainless Steel color. It does not have any other color option. On the good side, the color should be flexible enough to fit into most kitchens without looking out of place. Between these two coffee makers, Cuisinart DCC-3200 is generally more recommended. It has a better carafe and better features. The glass carafe looks nice and has a larger capacity. The unit itself has a carafe temperature control to keep your coffee warm for some time, along with brew strength control, auto off, and self clean functions. The coffee quality is great.